Buying a whole chicken has been the cornerstone of my meal planning for Live Below the Line. Thanks to the inspiration from Koj, Ceri and Miss South, I reckoned one chicken could stretch over a whole load of meals. 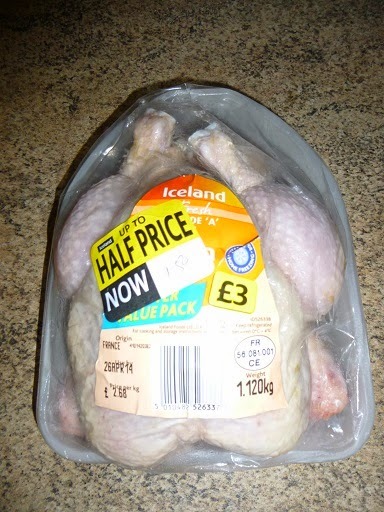 I started off with the mega bargain chicken for £1.50 (cheers again to the reduced section in the Iceland chiller cabinet). In fact, every lunch and dinner for five days, except for the cheese sandwich, will benefit from a single 1.1kg bird. It will be the main component of four meals, whether grilled chicken drumsticks, chicken sandwiches, chicken risotto and chicken & sweetcorn pie. I’ve also boiled up the chicken carcass and wings to make stock, which I’ll use to make two soups, one with Scotch Broth mix and one with carrots. Extra stock will add flavour to the chicken risotto and chicken & sweetcorn pie. 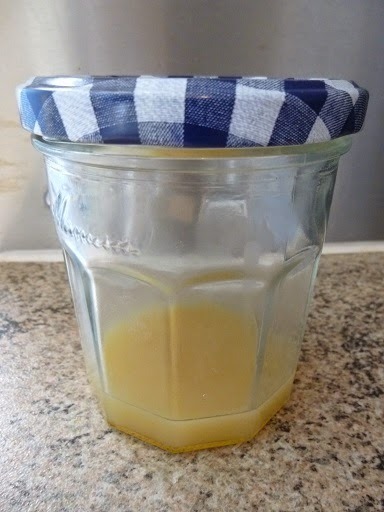 Rendered chicken fat. Gold dust, I tell you. Finally, I also followed Ceri’s careful instructions here, and rendered chicken fat from chicken skin. This meant that even though I couldn’t afford to buy a bottle of oil or use much butter, I still had fat to cook with. Plus my husband got to eat the crispy skin, which was pretty much the chicken equivalent of pork crackling. I fear a £1.50 chicken did not live a long and happy life. But it’s certainly increased our quality of life on a £10 budget.